We stand united in support of the march for Fraternity, Equality and Liberty. 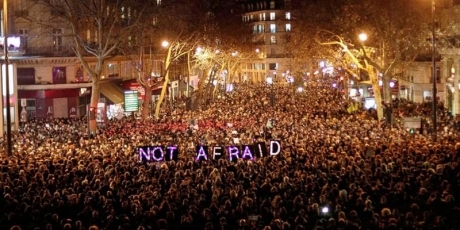 We are not afraid, and we will not be divided. Hundreds of thousands will march through the streets of Paris tomorrow to support the beautiful French values of equality, fraternity and liberty -- and we can be there with them. The entire world will be watching what happens as people take to the streets in response to the brutal murder of twelve people on Wednesday. Counter protests are planned, Europe’s far-right are mobilising throughout France, and two Muslim places of worship have already been attacked. This is just what the gunmen wanted: division and fear. But tomorrow we can show them that citizens everywhere also support the values the journalists, staff and policeman died for. Click below to join, and Avaaz staff in Paris will carry all our names in the march.